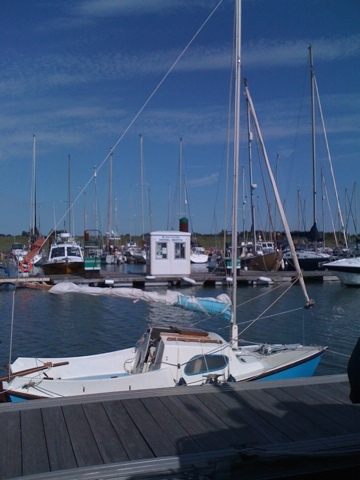 I do not think Essex Marina is as user-friendly for the trailer sailor as Burnham Yacht Harbour. Although the Marina is closer to where I live, I prefer the Yacht Harbour. 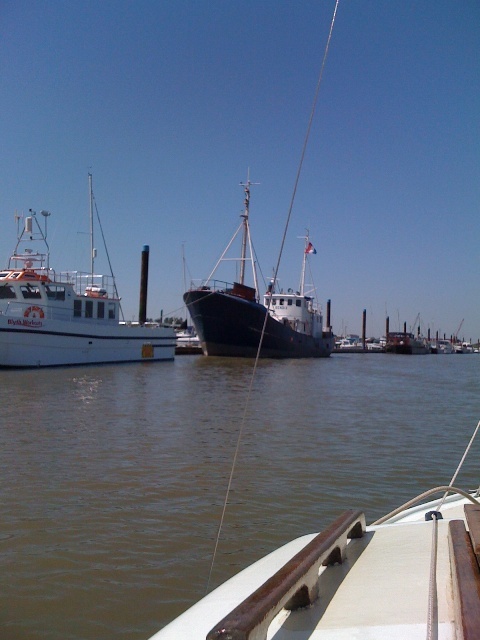 The main slipway for trailer sailers at the Wallasea Island Marina is directly exposed to incoming and outgoing tidal currents. 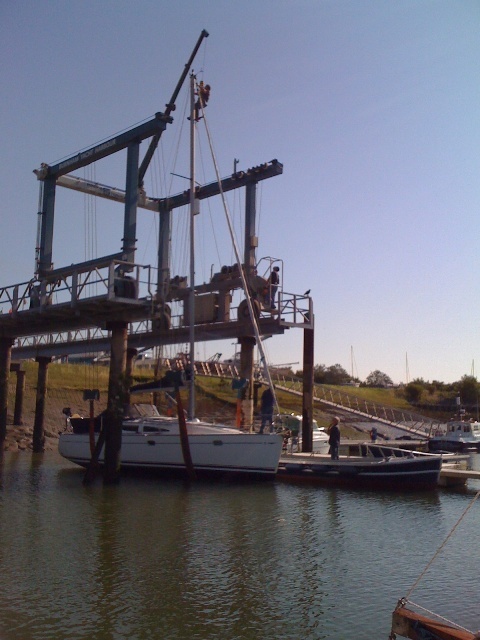 Not only do they make launching and retrieving a boat tricky, but the Marina slipway is exposed to all winds. 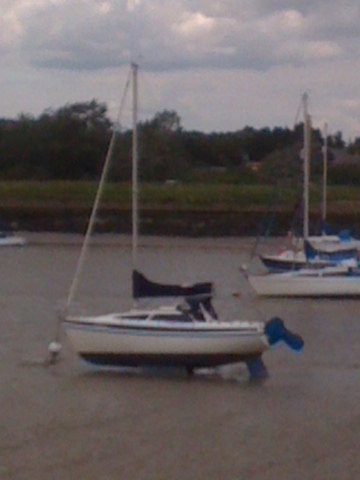 By contrast, the one at Burnham Yacht Harbour is sheltered by banks around its perimeter. 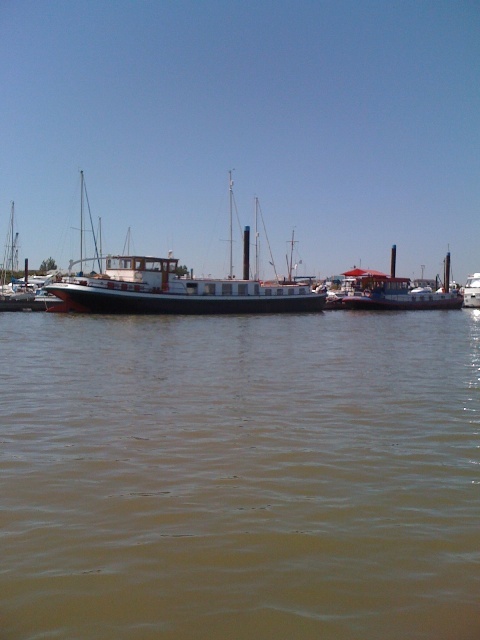 There are no strong tidal currents within the Harbour; therefore mooring a boat to a pontoon is easier than at the Marina where tidal currents of 2 knots can run at right angles to the north/south pontoons. 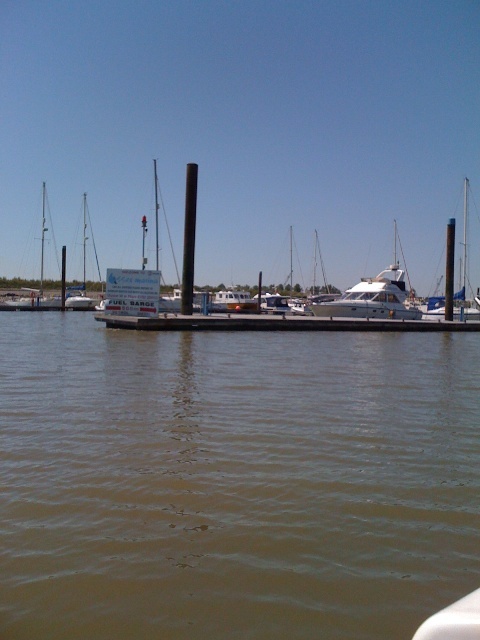 Common to both slipways the best time for launching or retrieving a boat is at the stand of high water. Doing it at low water would not be a pleasant experience on account of the slipways being covered with mud. If one were to launch a boat then there would be a slight advantage at Essex Marina because the slipway is equipped with mooring rings for attaching painters and warps. 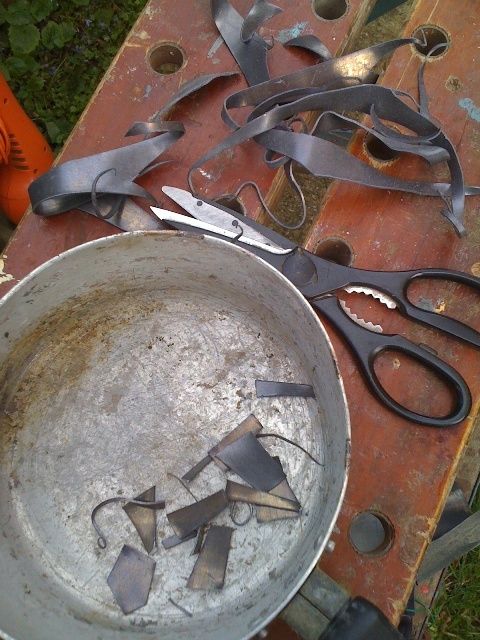 They are useful when the boat has to be left unattended while the single-hander parks his car and trailer. At the Yacht Harbour slipway there are no mooring rings. 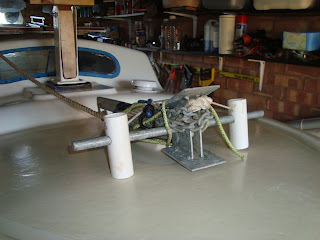 I improvise by tethering my boat to a disused launching trolley. I could set ‘Sandpiper’s’ anchor into the grassy verge beside the slipway, but I’ve not done so because of having to restow it and the warp. When I recently sailed by Essex Marina I took a few photos, of which a few are published here. 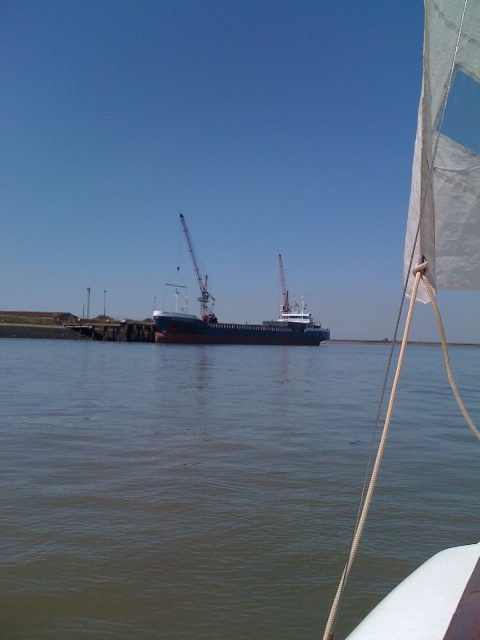 The above photo is of a cargo vessel at bit further upstream of the Marina at Baltic Wharf. 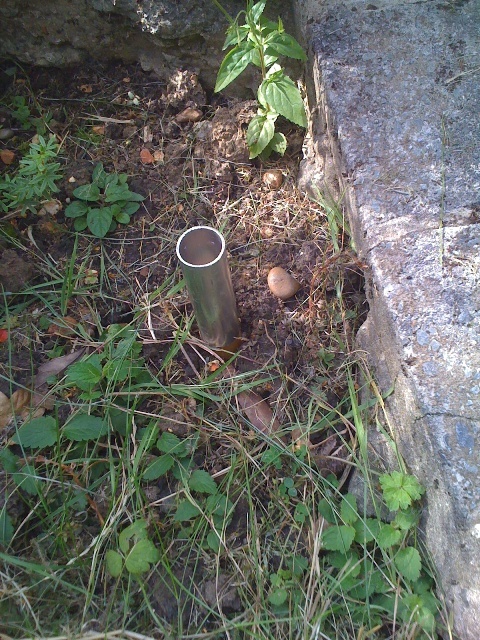 ‘Sandpiper’ does not have a depth sounder; therefore to measure the depth of water I have made a 1lb lead- line. Traditional leads weighed between 16 and 20lbs, but they could measure depths to 20 fathoms, i.e., 120 feet or 36.5 metres, and they had to be heavy to keep the line straight. 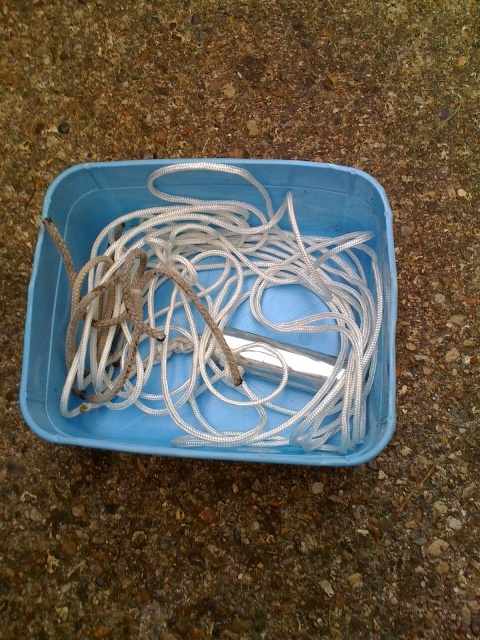 As I shall only be measuring a maximum depth of 7 metres, my lead need only be a pound in weight. Between 15th and 18th July I took ‘Sandpiper’ for a short cruise on the River Crouch. Instead of photographing items of interest with my Sony Cyber-shot camera, as was my usual practice, I photographed them with my iPhone’s camera. By doing so I could upload photos directly to my Blog. I had no need to format them, nor did I have to extract them from a camera’s memory before transferring them to my EEE PC for uploading to my Blog. In fact, I was not able to upload anything from my EEE PC to my Blog, because the applications were incompatible. A disadvantage of taking photographs with the iPhone’s camera is that the resulting images contain fewer pixels than those of the Sony; in a similar vein, the zoom facility is nowhere near as good as the Sony’s for recording detail. To date I have not published several of my photos taken during the mini cruise; therefore I am making use of this facility to show you three of them. They are not photos of artistic merit, but they do capture the flavour of the cruise. I think I’ve finally cracked it! 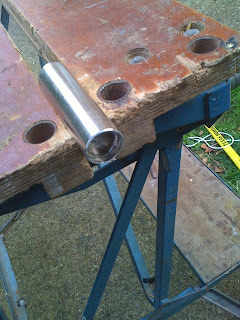 – not the bearings, but replacing a second set on the axels of ‘Sandpiper’s’ road trailer. Having changed the wheel bearings on the nearside wheel a week or so ago, I discovered the offside ones also had to be replaced. Today I did the job in less than an hour. In retrospect, I’m pleased the problem came to light when it did, because I’m now confident the new ones will be good for hundreds of miles, providing I prevent water entering the wheel hubs. As mentioned in a previous article, I came up with a simple solution for stopping water entering the wheel hubs. 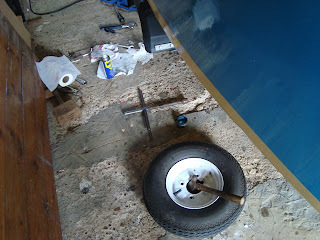 Before the boat is launched, I cover the wheel hub breathing holes with small pieces of insulation tape. By the state of the old bearings I think the trailer must be older than it looks. Water must have lodged in the wheel hubs for some considerable time to have made the bearings so rusty, and I’m thankful I did not tow the trailer over long distances before becoming aware of the problem. When I was inspecting the boat before I bought her, I was about to jack up the trailer to check the bearings, at which time the previous owner intervened. He said there was no point in looking at the bearings, because the trailer was virtually new. I agreed with him, and put away my jack. I’ve had time to reflect upon ‘Sandpiper’s’ mini cruise. 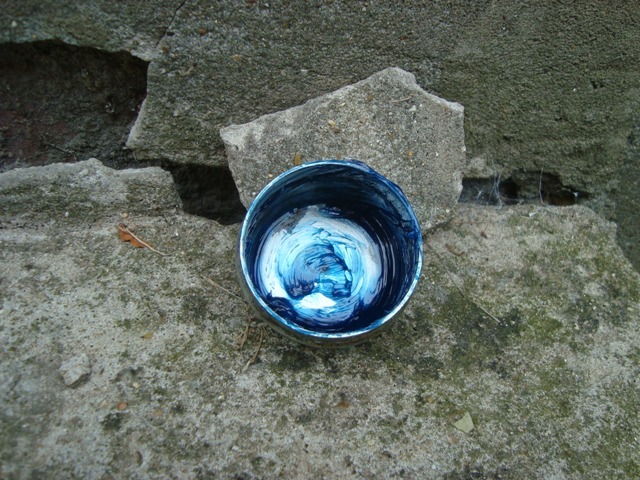 Was there anything that did not work? Could I make any improvements? Launching and retrieving the boat went quicker and more smoothly than the first time I took her for a sail. 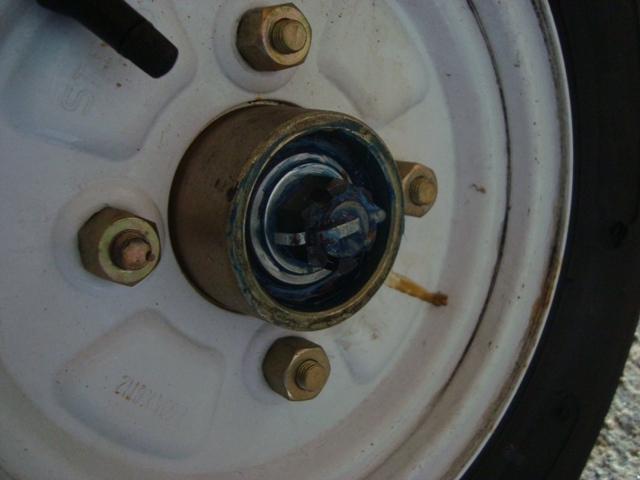 I am pleased that no water entered the wheel bearings because I took the precaution of applying insulating tape over the hubcap breathing holes. 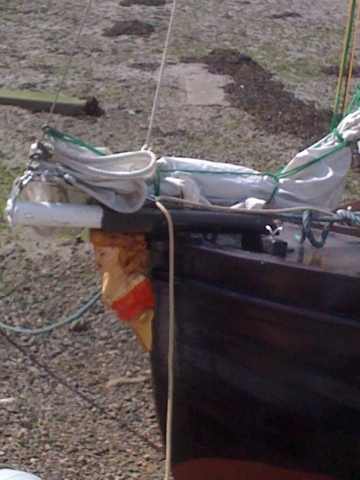 When winching the boat onto her trailer the winch rope cut into the rubber stopper that secured the bow. 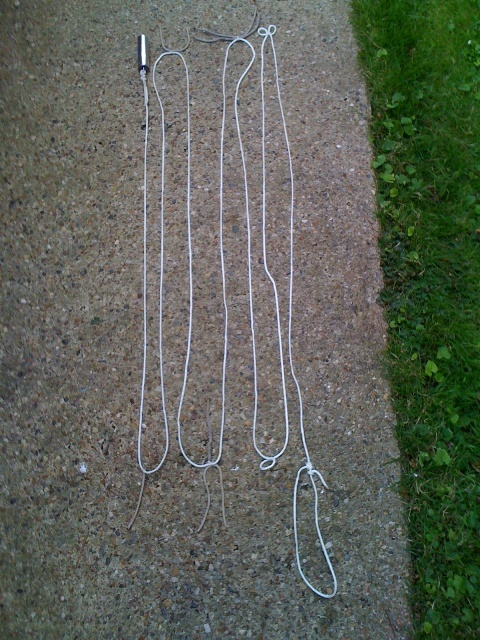 I shall have to slice an inch off the top to enable the rope to run freely. 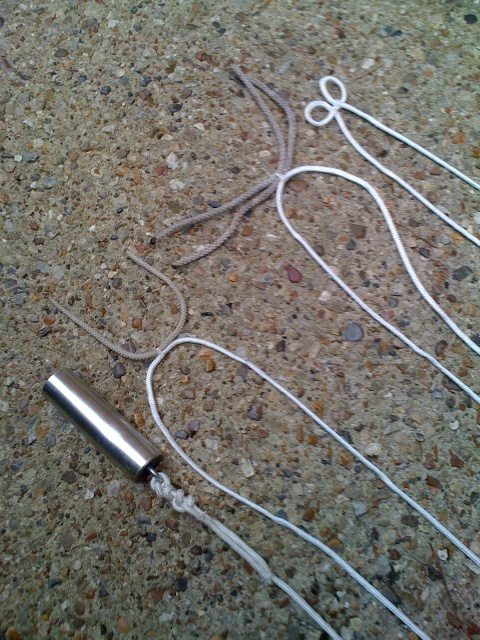 I found that anchoring was easier than before, because I stowed the anchor with the flukes facing forwards. 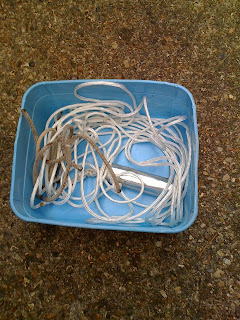 Making everything ready for setting up the mast took more time than I would have liked. 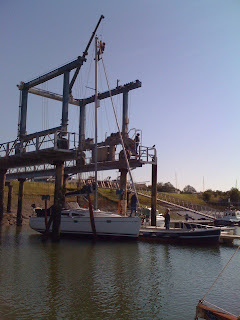 The reason for this was that the shrouds were secured to the mast for transportation, and I had to undo the lashings before the mast could be set up. I can’t think of a better way of securing the shrouds when in transit. Yesterday the wind at its peak hovered around force 2 enabling ‘Sandpiper’ to attain a speed of 3 knots, and in the gusts she manage 4. I was pleased with her overall performance, but I have yet to test her in stronger winds. The centreplate and rudder functioned as they should. 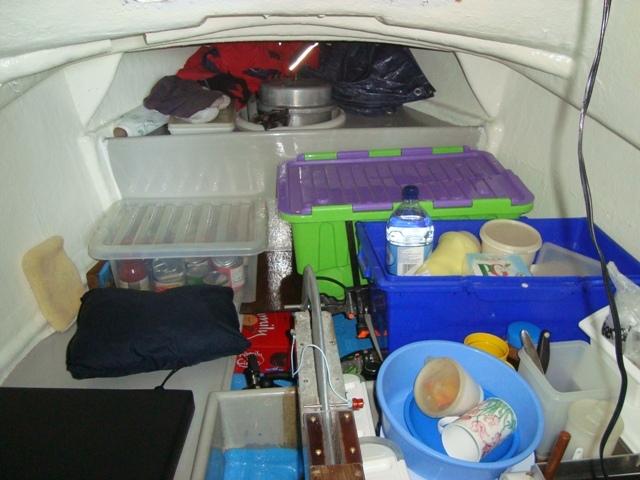 The interior stowage worked well. Everything was to hand when I was sitting on the port bunk. From there I could operate the stove and reach into large plastic bins for items I required. I arranged the stowage in such a way that I could make hot drinks and find snacks without too much effort. I didn’t think the outboard ran sweetly as it did before; therefore I’ll have to look into the cause – perhaps it was a partial blockage of fuel. 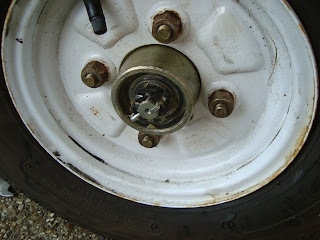 One important thing I discovered was that the trailer’s offside wheel bearings must be replaced. I recently changed the nearside ones, but at the time I didn’t think the offside ones had to be done. Checking everything before taking the boat further afield was necessary, because I want to minimize the chances of a major problem happening. In particular, I’m thinking of visiting Poole Harbour, which is a fair way from home. I’m hoping to take ‘Sandpiper’ there for the second week of August. The time is 0900 on Wednesday, 25th July. There is not a breath of wind, but I expect a breeze will set in by about mid-morning as the land heats up. I awoke before sunrise and listened to the shipping forecast which happened to be ten minutes after high water. According to the forecast I can expect a variable force 3, increasing to 4 from the north. As I ate breakfast I heard geese, skylarks, terns and a pheasant. The sun peeped over the river bank, and as it rose it changed colour from bright scarlet to vivid orange, finally becoming a dazzling, blinding golden ball. Four sport fishing boats motored by, and following in their wakes there was a small trawler. Three German yachts anchored nearby broke out their anchors and joined the procession to sea. As there was no way I could follow under sail, I resigned myself to sponging dew from the decks and tidying the boat. Low water will be at 1116 which leaves little choice, except to wait for the wind. Maybe there will be enough for sailing seaward against the incoming tide. 2030 Trailer sailing is quite amazing. Here I am at home with the boat unpacked and tucked away for the night. A lot has happened since 1050 when I got underway. This was possible because a light wind sprang up from the southeast. The last of the ebb saw us clear of Branklet Spit at the entrance of the River Roach. From there it was a matter of tacking to and fro with the intention of reaching the Inner Crouch Buoy before we would be swept up river towards Burnham. 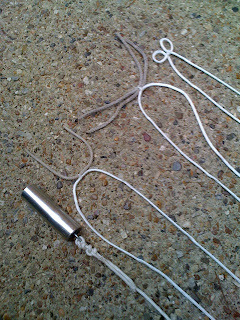 For twenty minutes we made no progress whatsoever, but the process of tacking was very enjoyable. There was plenty to see, what with loads of yachts and hordes of juniors racing Lasers and Toppers. Several safety boats were kept busy towing strays back to the start line. 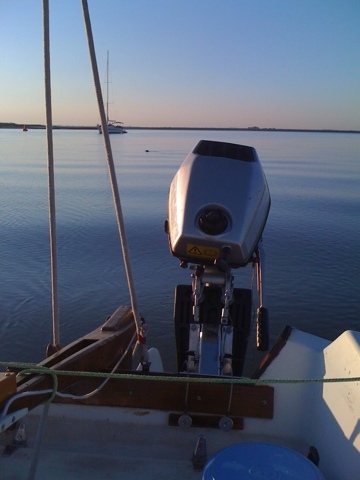 Our speed downwind through the moorings was breathtaking, considering only half of the jib was set. 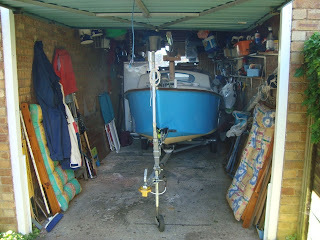 I rapidly prepared the boat for mooring in the Yacht Harbour, and started the outboard. It soon became clear that I could put 'Sandpiper' on the slipway straightaway. In no time at all she was on her tailer, ready for being prepared for the road. The time is 1510 on Tuesday, 24th July. I am sitting in the cabin of 'Sandpiper' to keep out of the baking hot sun. 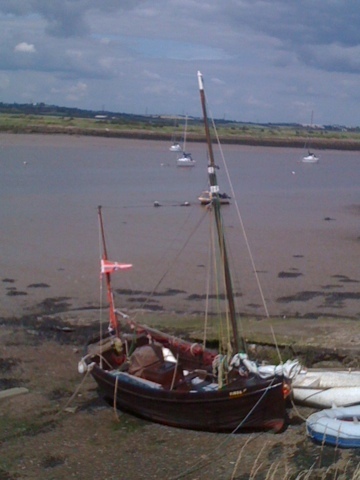 The boat is at anchor halfway along the south bank of Eastern Reach - that's to the south of Bridgemarsh Island. Apart from the occasional wash of motor yachts, it is very peaceful. Now and again I hear the high-pitched song of skylarks. The rippling chatter of water running along the sides of the hull is soothing. As the wind increases it brings a thrilling thrumming note to nature's orchestral praise. There is joy in Heaven today. Sparkling water covers squelchy mud where a pair of Egrets fed and two loving terns preened their feathers. Another hour and the ebb will run. Shall I stay put for a night of stars and a sickle moon? The temptation is great; what better could I do to escape and be alone? 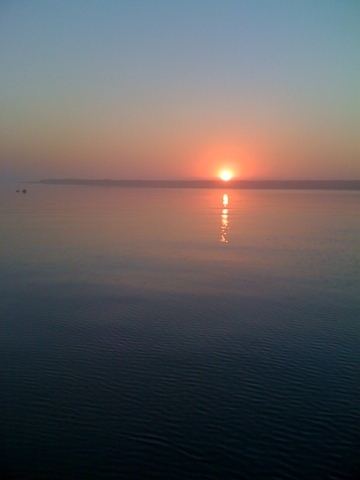 I had hoped to sail to the wonderful Blackwater, but early this morning there was no wind, and I didn't fancy motoring. Instead, I walked to the Co-op and bought myself goodies and long-life milk. A flotilla of motor yachts have this moment rushed by, causing havoc on the way. Waves crash on the muddy banks of Bridgemarsh Island. Terns screech in retaliation. Will more of these monsters send their washes to violently rock my tiny boat? At 1645 I could not resist the call of the wind and the beckoning of the ebb, so I broke out the anchor and tacked towards Black Point. A force 2 soon had 'Sandpiper' at the beautiful Cliff Reach where trees overhang a small sandstone bank. The fast-flowing ebb made for exciting sailing through the Burnham moorings as the wind gradually decreased, but there was enough to take us to our anchorage in the River Roach. The sun was about to dip beyond the horizon when a cute seal silently swam around the boat, and a sickle moon hung motionless in a pale blue sky. 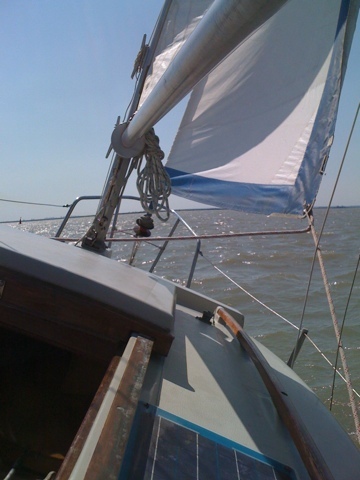 Fabulous weather for boating on the Crouch, and it was my good fortune to be invited for a sail by the owner of 'Ladybird', a 19' Sea Wych that once belonged to me. She was, and indeed is a charming little family day sailer. I used to call her my mistress because she bewitched me with her loveliness. We had a lot of fun together and many adventures, but the time came when I could no longer afford her, as can be the case with a mistress, so I'm led to believe. We had to part and she was sold to the highest bidder. Today we were reacquainted, and what a pleasure it was to see her. Her new master has invested his time and money by improving her. The impressive entrance to the cabin is something to behold. Made from solid oak panelling that once graced a kitchen cabinet; the washboards would not be out of place on a finely crafted Dutch Botter. A thief trying to gain entrance would have a very hard job of it. Unknown to him he would have to smash his way through an inner panel made of very thick aluminium. To make his task even more challenging he would have to disable a huge security log that is also alarmed. Potential thieves, do not try. If you were to succeed you might find a note inside the cabin to the effect that you have been had, for there is nothing of any great value aboard. Everything was perfect for a great sail. We didn't go far, but the quality of the experience could hardly have been better. In turn our hats were blown into the water, giving us practice at picking up a man overboard. 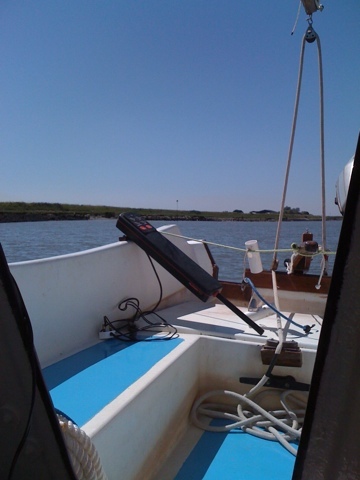 At the start we managed to hook the mooring buoy's line on the rudder! Anchoring practice went to plan. We nestled close by the south bank out of the wind and ate lunch. 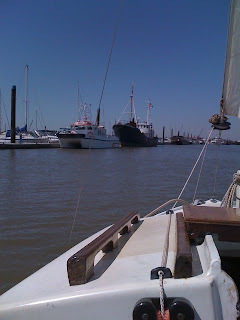 Another sail seaward; practice at heaving to, and a fetch back to 'Ladybird's' Rice Cole mooring completed our adventure. OK I made it at last. The time is 1830. 'Sandpiper' was successfully launched ten minutes before high water. 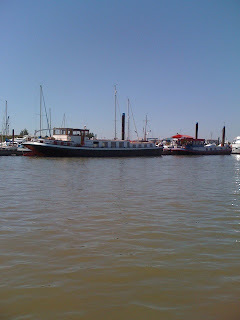 Having made the boat fast to her pontoon I went for a walk beside the river. Being a Sunday there were many people enjoying the beautiful weather. There was a cooling southerly breeze coming off the water. I've never seen so many dogs having walkies, doing their whatnots, sniffing here and there; mums and dads with their kids, all licking ice creams; yachties leaning over balconies downing cool drinks, and on the river yachts sporting full sail. For the first time this year I felt I was on holiday. I'm relaxed looking forward to tomorrow when I'm hoping to meet the owner of 'Ladynbird' for a sail aboard my old 'mistress'. She will seem positively huge by comparison with my West Wight Potter. Well, I'm hoping I'll have a good night's sleep. 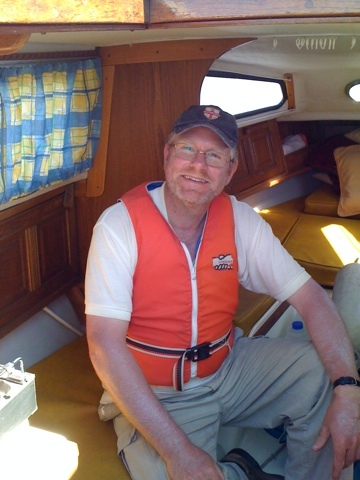 I shall make myself comfortable by wearing pyjamas, which is a luxury, as I usually turn in on the boat dressed, to be ready for any emergency that may turn up. 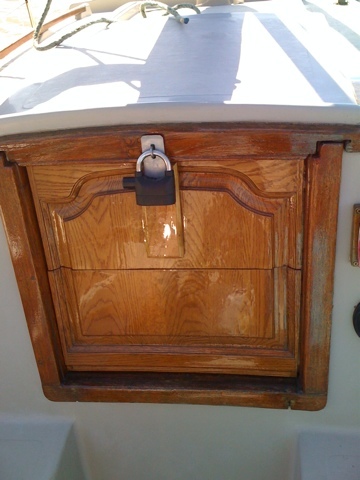 This is a precaution when anchoring off for the night. I hope there will not be one tonight, because I'll be caught with no pants on! 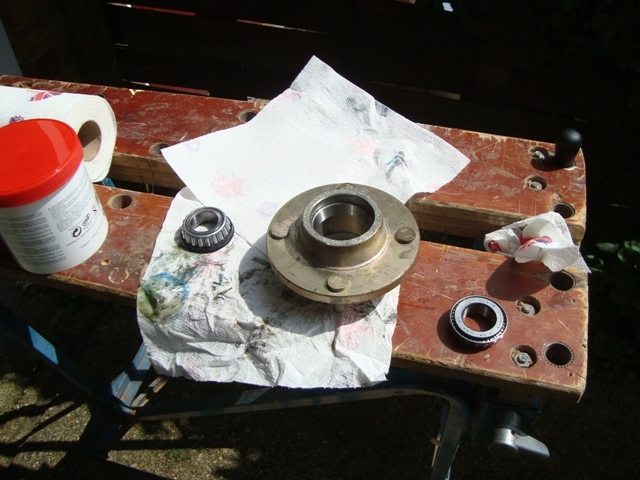 As I suspected, the nearside outer wheel bearing was rusty. 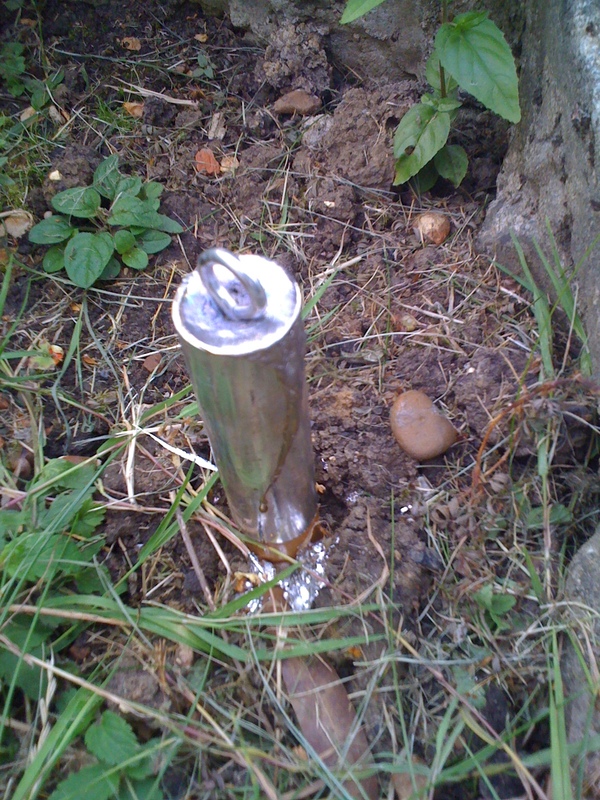 Getting the hub off the axel was not at all difficult. 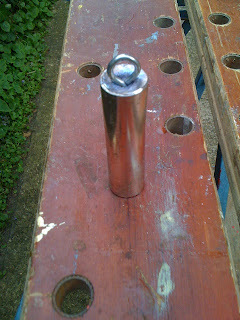 After removing the retaining nut, I gave the hub a sharp blow with a wooden mallet and it flew off. My third phone call brought the good news that replacement bearings were available at Basildon. An hour-and-a-half later, with a shiny, new set of bearings in my hand, I was home in time for lunch. 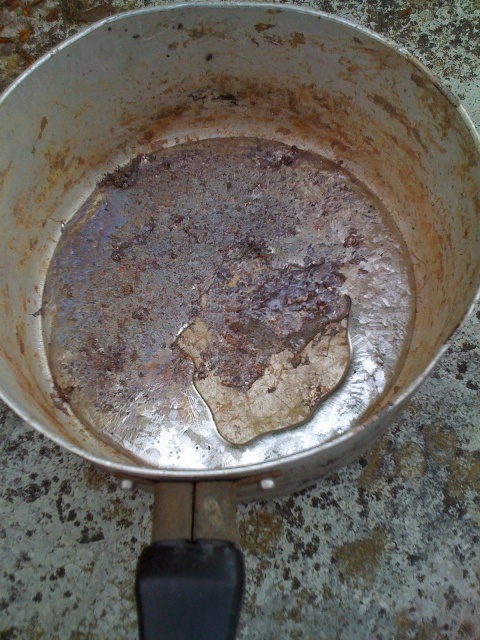 Having eaten to increase my energy levels, I set about inserting new outer bearings, but not before squelching grease into all of their nooks and crannies. I didn’t think I would enjoy having dollops of grease on my hands, but I found it fun. A neighbour remarked that what I had done must be quite satisfying, and I had to agree. I think another neighbour was amazed that I had succeeded in doing the job, and I must admit that I surprised myself. As far as I can see, the trailer should be good for many more miles, providing I do not let water enter the wheel bearings. 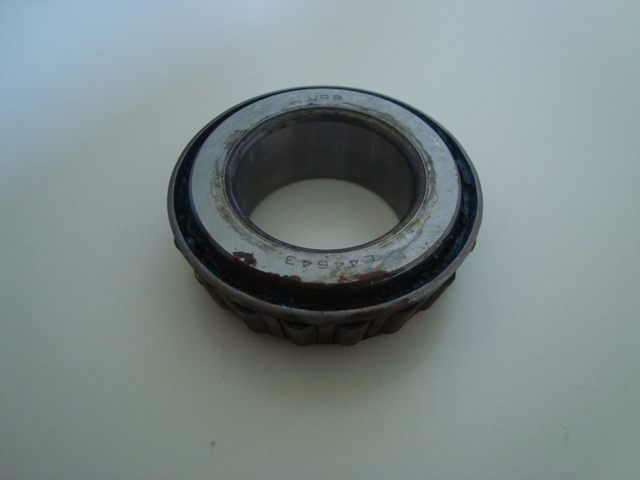 I observed that water did not enter the inner bearings because they were sealed with rubber rings. Therefore, if I can prevent water seeping in between the edges of the hubcaps and their tiny breather holes, all should be well. To bring that about I have greased the joints between the hub caps and the hubs, and before I launch the boat I shall cover the breather holes with small pieces of insulation tape. 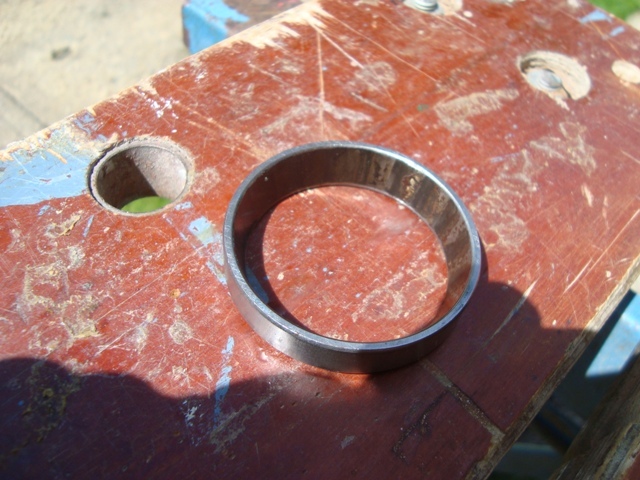 I shall make sure the bearings have cooled by not launching too soon after arriving at a slipway. 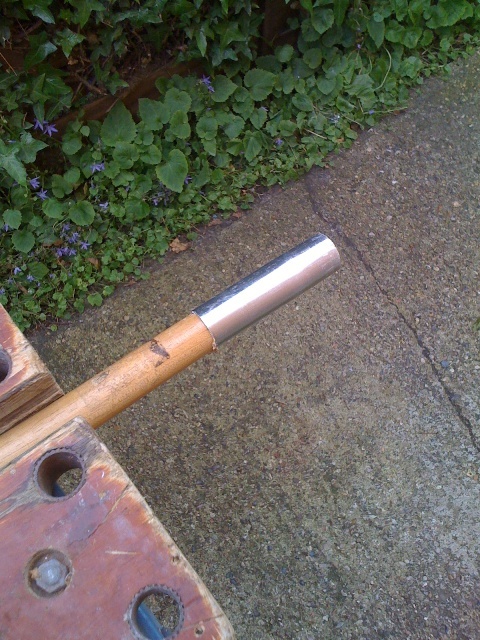 Time taken to replace the bearings prevented me from launching the boat today; therefore I am hoping I shall be able to do it tomorrow shortly before high water – most likely at Burnham Yacht Harbour. I am pleased that I became aware of the defective bearings, because had I taken the trailer for an appreciable distance, the nearside wheel could have seized because of overheating. By replacing the bearings I have saved a bit of money and I shall feel confident about taking the boat further afield. I’ve owned a few small trailer sailers, and with each one of them I’ve spent far more time preparing and checking them than their trailers, but without roadworthy trailers they would have remained at home. When I bought ‘Sandpiper’ I was told by her owner that her trailer was almost brand new. Certainly it looked in pretty good shape. 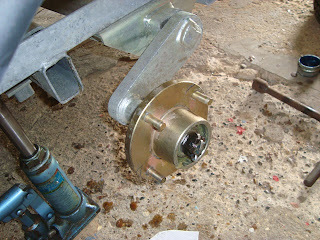 Since then the trailer has only done 90 miles; therefore the wheel bearings should be in excellent condition. 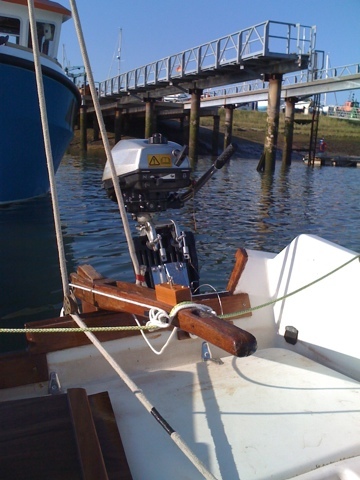 When I launched 'Sandpiper' at Burnham Yacht Harbour, almost a month ago, I could not persuade her to come off the trailer until the wheel bearings were submerged. I was a bit reluctant to let this happen, but I recalled that I had the same problem with all except one of them. Because the wheel bearings were submerged, albeit for a brief period, I thought it would be prudent to examine them. I should have immediately done so after launching ‘Sandpiper’, but that was not feasible, because I had to moor the boat and cook a meal before turning in for the night. I forgot all about the bearings until a few days ago. I managed to remove the hubcap from the offside wheel before heavy rain prevented me from doing likewise to the nearside wheel. Later, when I tried removing the nearside hubcap it refused to part from the housing; furthermore, rain stopped play again. Maybe I’ll have another shot tomorrow. The forecast is for sunny weather over the next few days. 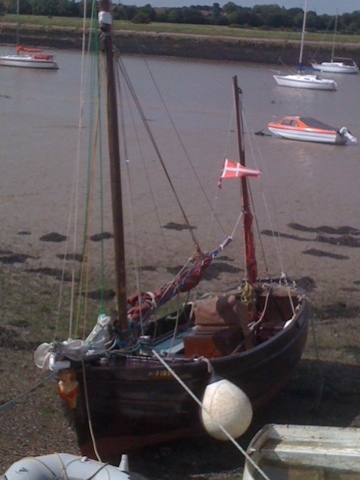 Most likely I shall take ‘Sandpiper’ to the River Crouch. I've not decided where I shall launch her: Hullbridge, North Fambridge or Burnham. 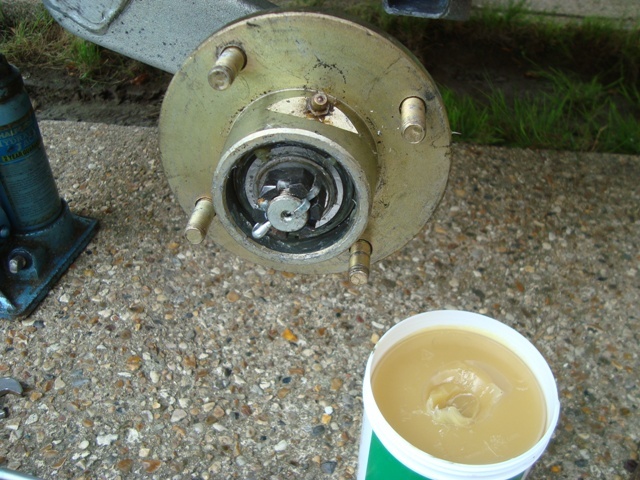 The proviso is that I must first remove the nearside hubcap to see if the bearings are OK, or I’ll not be going anywhere. I believe the painful saga has come to end, but I’m not quite sure. 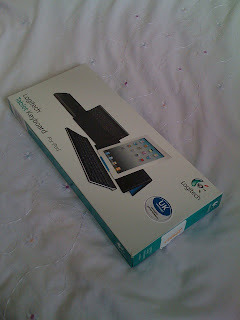 As far as I am concerned, Comet has done the honourable thing by reimbursing my money for the Logitech Tablet Keyboard. The fellow who dealt with me explained that the issue was not between Comet and me; rather it should be between me and Logitech. If the website had included that information, I would not have purchased the keyboard from Comet. Consequently I’ve been struggling to pair my iPhone 3G with the keypad. That struggle included a visit to the Apple shop at Lakeside. Taking into account time spent trying to link the phone and time and effort travelling to and fro, I am out of pocket, but on the positive side I’ve learnt a lesson that I cannot believe everything I read on a website! On reflection, I feel sure the paucity of information at the Logitech website was not deliberate. The fellow at ‘EMEA Support Logitech’ sent me his promised email. 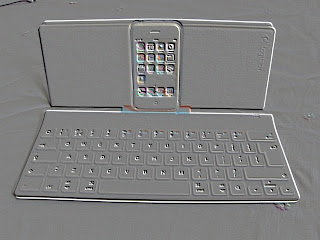 He said the Logitech Tablet Keyboard was ‘exclusively’ designed for iPad 3rd generation, iPad 2 and iPad. He went on to say it cannot be used with iPhones. Clearly he is wrong, because the keyboard positively pairs with iPhone 4 – but perhaps not every function key on the keyboard will operate as it does with an iPad. Right now I’m very happy to stop banging my head against a brick wall for a chance to recover and to delete painful memories as if they never existed. So the saga continues, but the end is nigh. Comet would not reimburse my money, because the assistant who served me demonstrated that my Logitech Tablet Keyboard could be paired to his iPhone 4. 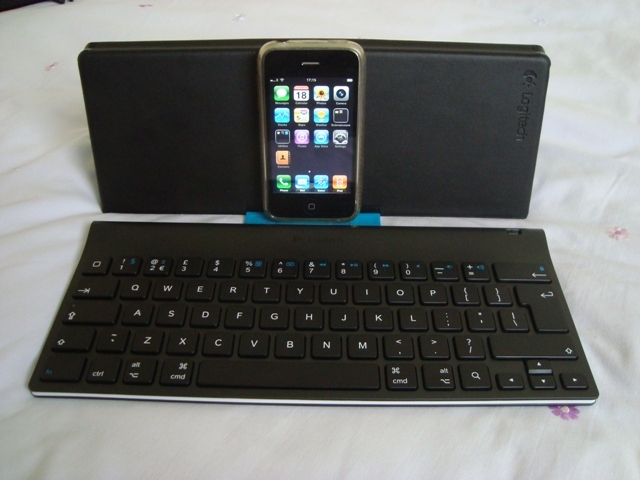 I pointed out that blurb on the Logitech website stated that the keyboard was compatible with iPhones. What I didn’t know was that in very small print at the support page for Logitech keyboards there is an almost hidden notice saying that the iPhone 3G is not supported, even if its operating system is 4.2.1 which mine is. That in itself is puzzling, because the iPhone 4 has an identical operating system. 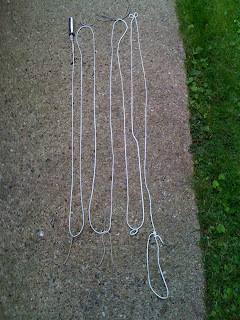 The long and the short of it is that the man at Comet advised me to visit my nearest Apple Store for help. I went along to Lakeside and I was greeted by an Apple Store technician who did a fantastic job researching why my phone would not pair with the keypad. He referred the case to a Logitech specialist who said he would look into the matter, because he (the Logitech man) did not understand why. He promised to send me an email outlining his findings. That still leaves me with a keyboard that does not pair with my phone. When I told the Apple chap that Comet did not refund my money, he exploded like an erupting volcano and immediately phoned the Comet Call Centre to ask if I should have been given my money back. They categorically said I should have been reimbursed. I am now left with a quandary, do I revisit the Comet store and demand a reimbursement, or do I keep the keyboard for when I may possibly own an iPhone 4 or an iPad? I could auction it on Ebay or give it away. One thing for sure, the pain has come to end. I am resigned to the fact that unless I change my phone or obtain an iPad, the keyboard is as useful to me as a million dollars in cash is to a starving, dehydrated castaway on a desert island! From the opening remarks you may gather that the quest for a suitable Bluetooth keyboard continues, along with my frustration caused by not succeeding at pairing one with my iPhone 3Gs. This morning I thought Providence was on my side when Maplin willingly refunded cash for the Cerulian keyboard. 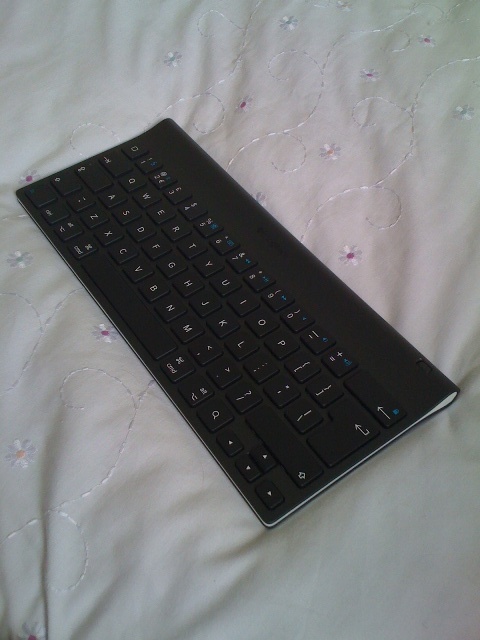 Overjoyed with getting my money back, I immediately went next door to the Comet store and negotiated a fantastic deal for a Logitech Tablet keyboard. 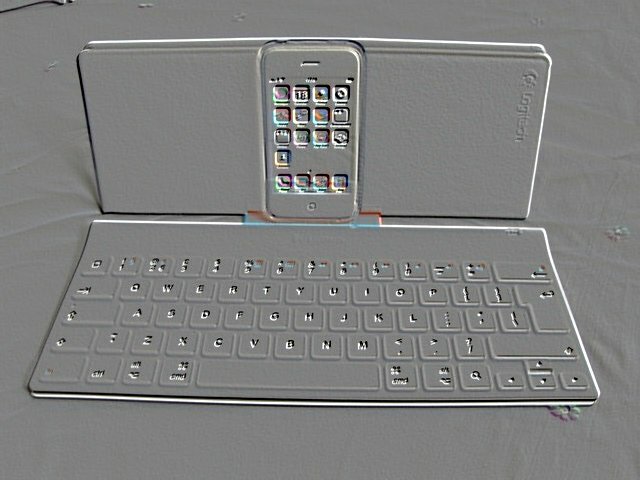 Feeling chuffed; I went home and set about pairing the newly acquired keyboard to my iPhone. Yet again I had no joy; instead I was disappointed. There were no instructions in the box as to how the pairing should be done - only a web address printed on the inside of the box. This yielded zilch, whereupon I was left to search for instructions how to do it. I can only conclude that there must be something wrong with my iPhone’s Bluetooth gizmo, and I am almost resigned to accepting that I shall not be able to pair it wirelessly with any keyboard, but there is a faint glimmer of hope, because the guy at Comet said that if I could not do it he would try. However, despite my usual optimism, pessimism weighs heavily in the balance. Shall I suffer more self-inflicted torment? I hope so, to satisfy my lust for masochism, and for the good cause of my Blog. I’m always on the lookout for a good deal – something cheap; as good as or better than the pukka job. That seldom works and I never learn from my mistakes. I did a bit of research on the Internet looking for cheap mini Bluetooth enabled keyboards suitable for the iPhone 3Gs and came up with two: a Logitech Tablet keyboard and a Cerulian keyboard. The latter was about the same price as the former, and it was immediately available at my local Maplin store. Being more compact than the Logitech and about the same size as the keyboard of my tiny EEE PC, I decided to go for it. I moved like a double flash of lightning!! Back at home my frustrations began. Getting the Bluetooth devices connected was a total failure. I followed the simple instructions, but no matter how many times I tried linking the phone and the keyboard, I was unsuccessful. I turned off all Wi-Fis hoping that would help, and I know for a fact that the iPhone’s Bluetooth was working, because it picked up a signal from my digital house phone. Loads of advice on related Internet forums could not provide a solution. After all my efforts, I’m resigned to returning the Cerulian keyboard; hopefully get my money back and buy a Logitech keyboard. 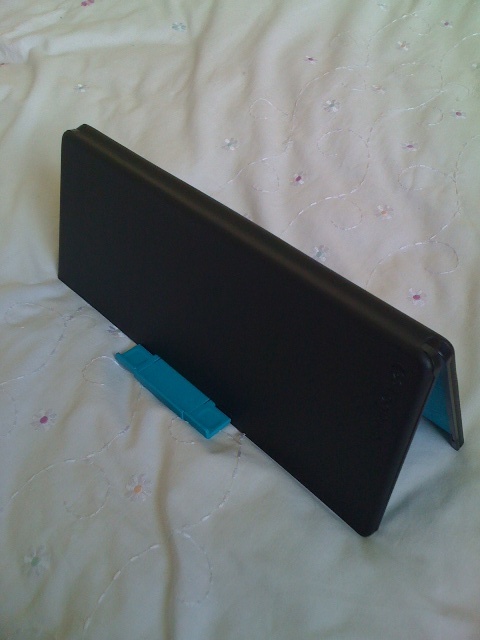 My nearest PC World with one in stock is at Thurrock, a fair way to go ……………. more petrol, more hassle, and perhaps no success. Is all this worth doing to make blogging from my boat easier? I’m beginning to have my doubts. I should bear in mind that ‘small is beautiful’, and the principle of KISS. This afternoon I thought I would further test the technology by uploading to my Blog through 3G in the open at Hullbridge. 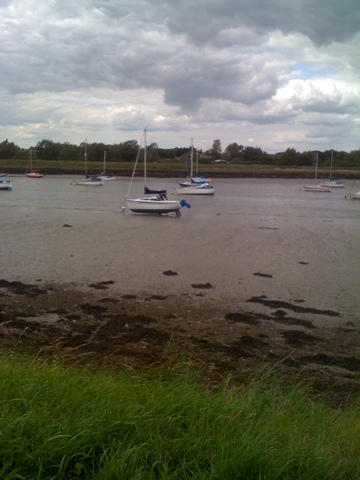 Right now I am sitting on a bench overlooking the River Crouch. Directly before me the water is ebbing. A Leisure 23 has settled on the mud. Other yachts remain afloat. There is 80 percent cloud cover. Now and again the sun breaks through, bringing light to the scene.